My coloured pencils feature more often in my projects these days. 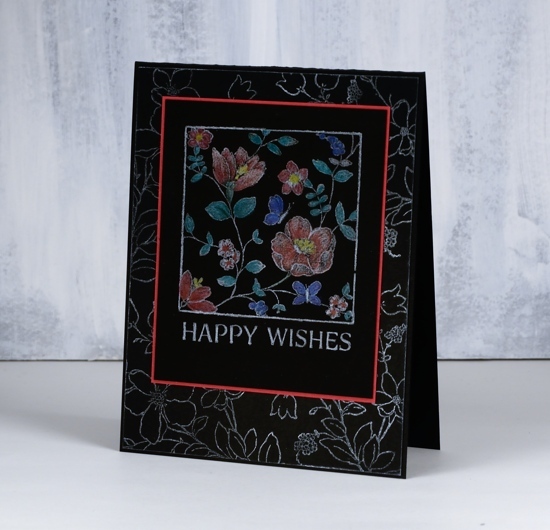 To create this card I stamped the Penny Black floral stamps in delicata white shimmer ink then coloured with my Faber Castell polychromos pencils. 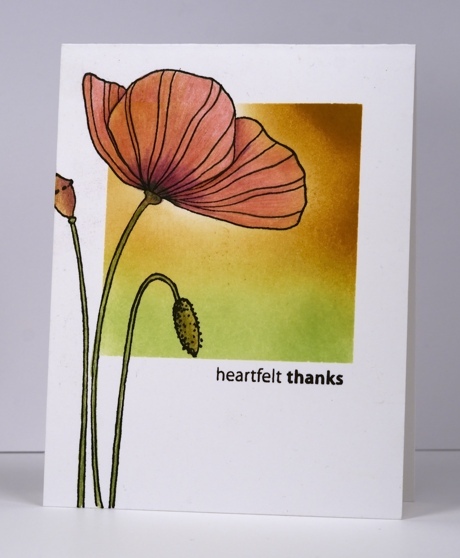 The feature image is from a 2-stamp set called ‘appreciation’ and the background image from a floral set called ‘ebulliant’. I used a white pencil to lightly colour the flowers and leaves before adding other colours over the top. I also coloured over the border and sentiment with a sharp white pencil to make them pop a little more. I have been using my coloured pencils more often recently. 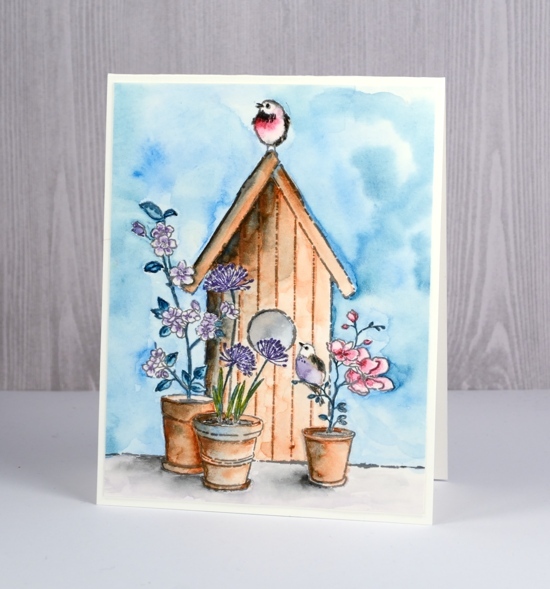 For this card I used them to add finishing touches and details after I had painted the majority of the design with watercolours. I used my gansai tambi paints for the watercolour then polychromos pencils for the details. I even wrote down the numbers just in case you were interested but really you don’t need my choices you could just use your own favourites. One thing I did which worked in my favour was limit my colour palette. I mixed colours I had already used rather than continually adding new ones. This helps with the cohesiveness of the finished panel. 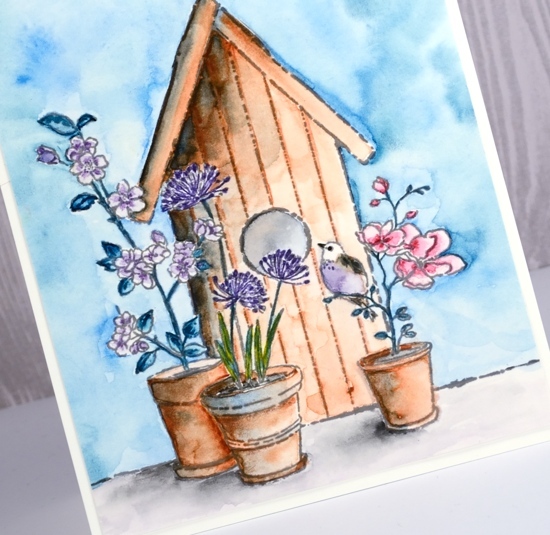 I started by stamping the ‘aviary’ stamp on hot pressed watercolour paper in versafine smokey grey. I painted the area surrounding the birdhouse first with blue and green paint. I kept it mainly blue and used a ‘wet into wet’ method, painting around edges first with water then adding paint. A medium sized brush that comes to a good point can help with this as there is a lot of space to cover but also some tricky areas to navigate. Also if your brush is too small or doesn’t hold liquid well you will be forever picking up more water or paint. Once the background was dry I painted the flower pots in brown and added shadows with the blue I used on the sky. After that I painted the birdhouse, once again with the brown and blue then added black for some darker shadows and definition. I decided to limit the flowers to pink and purple painting the taller plant on the left with a diluted purple paint and the magnolia on the right with touches of dark pink blended out with water. I left the centre flowers to do with coloured pencil. I used the same green from the background to paint the leaves and a combination of colours already used to paint the birds. I couldn’t decide on a colour for the foreground the pots are sitting on so I used the dirty paint water. It turned out to be a teeny bit on the purple side but mainly on the dirty side so it didn’t clash with anything else. I added shadows with black. With all the basic painting done I switched to coloured pencils to add fine details. I picked pencils that matched the paint colours and went over some outlines or added tiny details inside leaves and flowers. 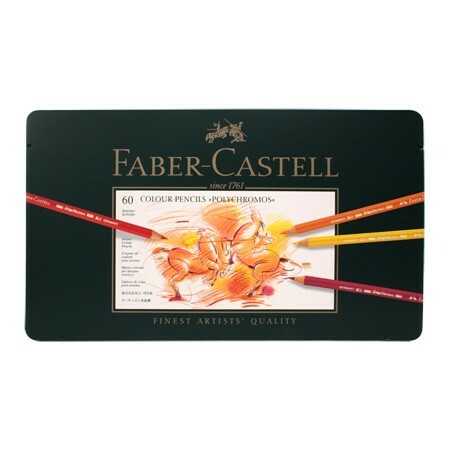 After teaching some colour pencil classes I am feeling inspired to use my pencils more often. 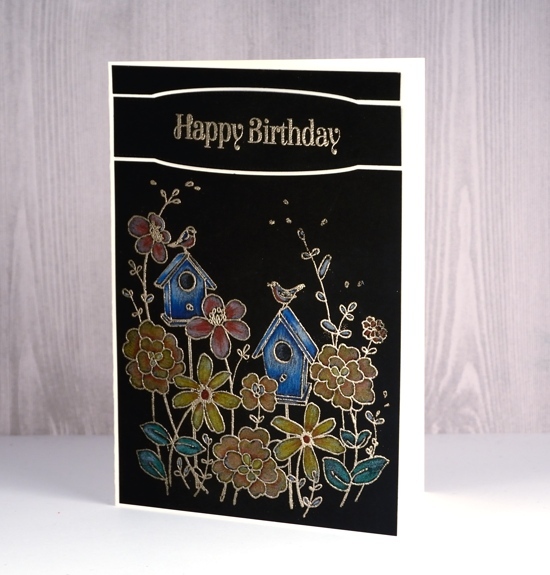 I especially like the look on black cardstock but it is trickier to get a good photo. 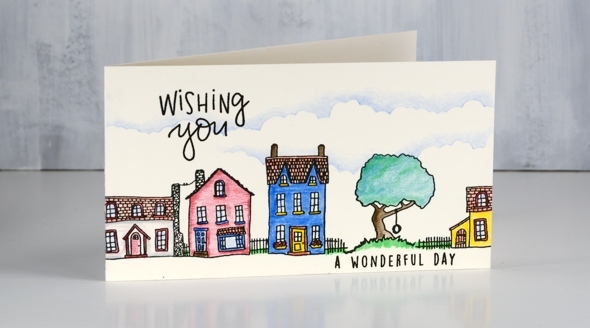 I used my Faber-Castell polychromos pencils for this card paired with the ‘good neighbors’ stamp from Penny Black. 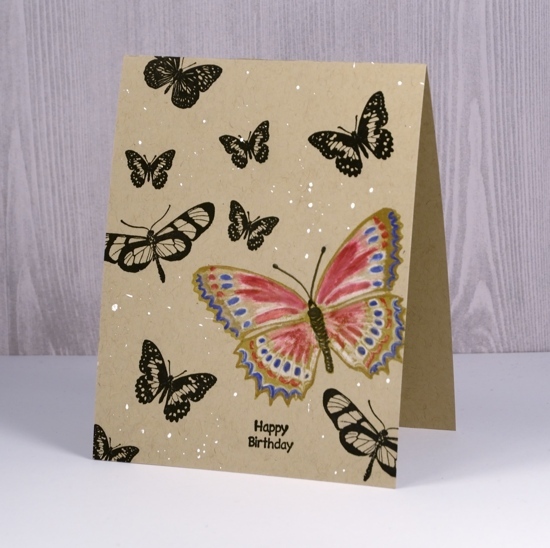 I embossed the stamp with platinum powder then used a selection of coloured pencils to fill all the images. 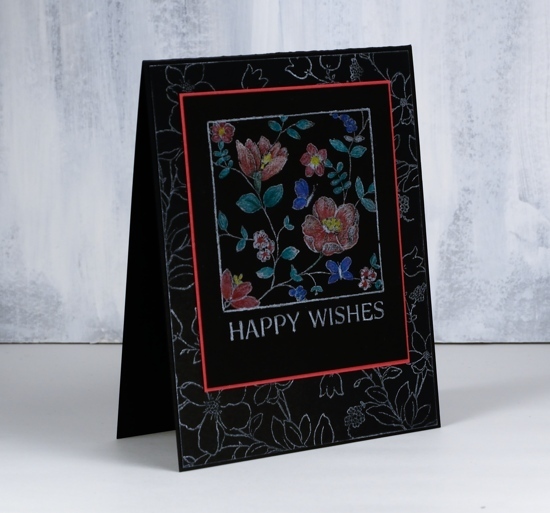 I wanted the sentiment to add some more interest to the black panel so I die-cut the top of my image panel with one of the PB stitched edges dies, used the same die to frame the sentiment then cut a little strip again with the same die to complete the rectangle again at the top. 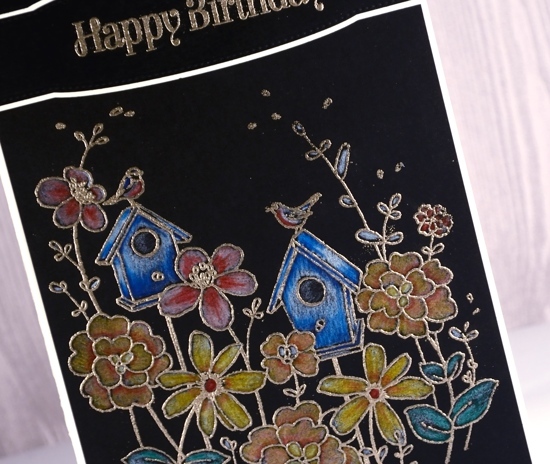 The sentiment is embossed in platinum and then all the panels are attached to a cream card base. A little larger than my usual, hence the side fold. I’m teaching a coloured pencil technique class in Toronto in April; you can find the details on my upcoming classes page. I spent a large chunk of today working on a future class, not the projects (the most fun part), but the photography, editing, promotional blurb, etc. While doing that I got inspired to combine the technique from the class next week with the theme from the class next month and this quick card was the result. I haven’t done a one layer card in a while and I rarely work with kraft cardstock so it was fun to change gear a little. 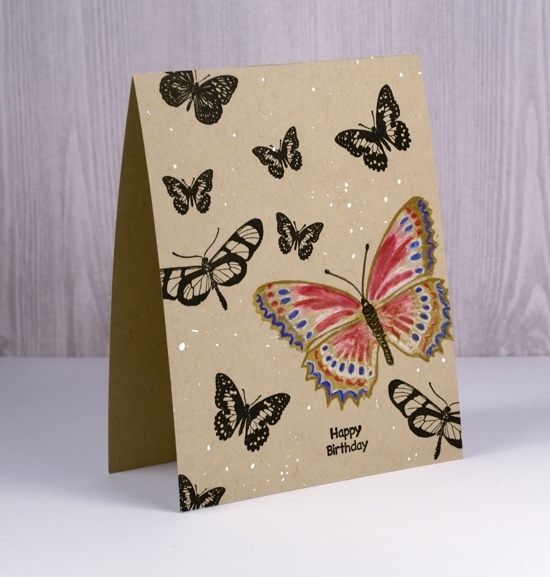 I stamped butterflies from the Darkroom Door set, ‘Butterflies‘ in versafine onyx black and toffee inks then coloured the toffee one with coloured pencils. 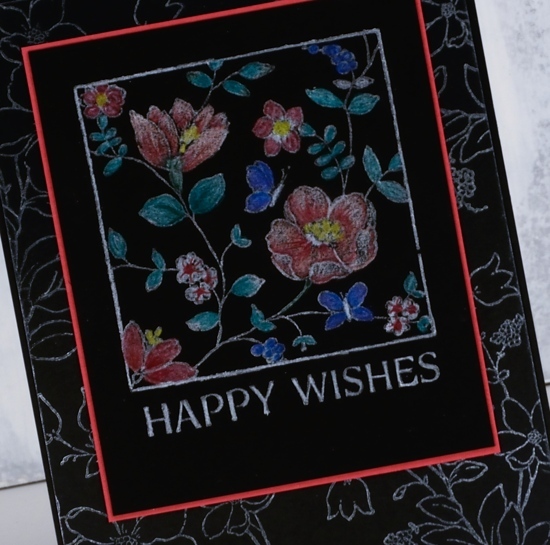 The white paint over the card front is part random splatter of copic opaque white pigment and part sigma white gel pen dots. The sentiment is from the DD set, Happy Birthday. 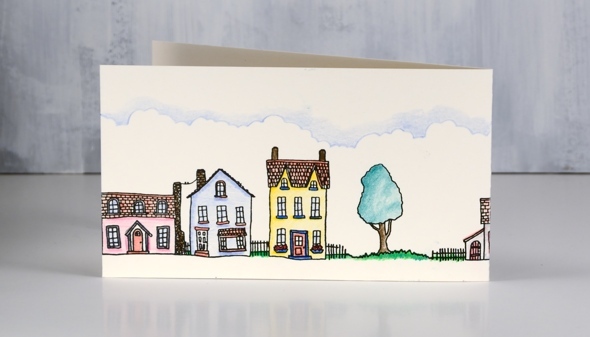 I am always keen to participate in Kathy Racoosin’s 30 Day Coloring Challenge but never manage it on all thirty days. Today’s colouring did not take long, which is what she suggests, and it was fun to squeeze it in. 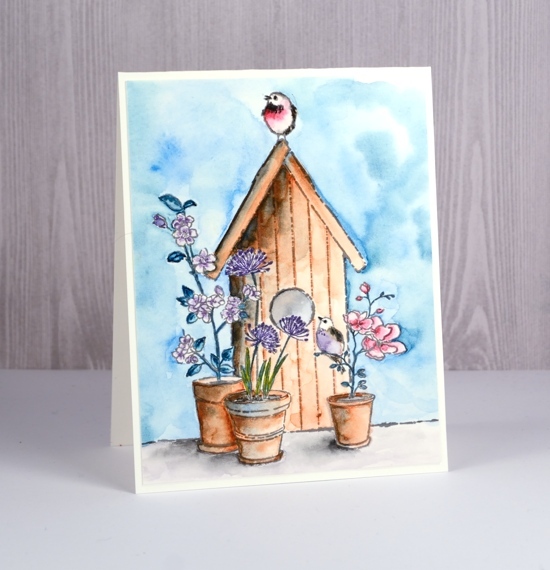 Susan is hosting the new One Layer Simplicity Challenge and she has chosen six gorgeous summer colour palettes to inspire us. 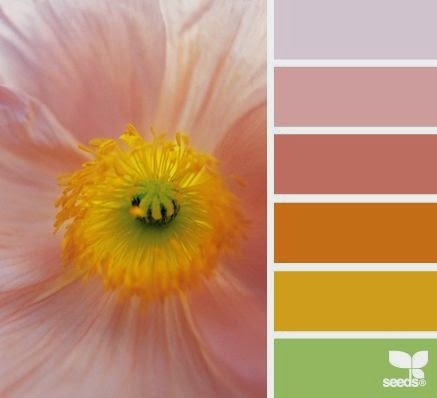 I chose the one below which was a challenge as I don’t often combine pinks and yellows. I just did a big clean up and reorganization of my craft area and in doing so found the card base above with the square already masked and the green sponging started. I sponged more of the square in memento peanut brittle. I then removed the mask and stamped the poppy in versafine onyx black. I decided to use my coloured pencils for the poppy because I had the colours in the photo. I blended one colour pencil over another rather than using a blending fluid or blender pencil. Have you visited the new One-Layer Simplicity blog? 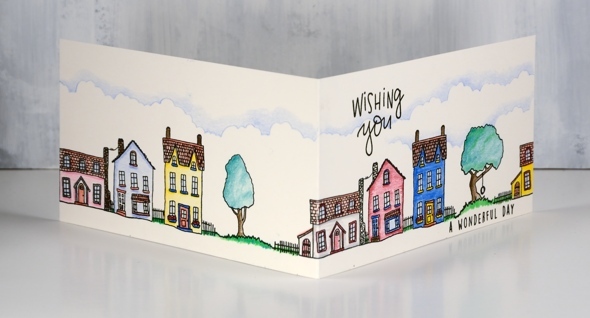 What once was One Layer Wednesday is now One-Layer Simplicity and has its very own blog where each month you will find a new challenge dreamed up by one of the design team. The challenge will appear on the first of the month and you will have until the 24th to add your challenge entry. The first challenge hosted by Susan is to restock the shelves with whatever card you are short of. 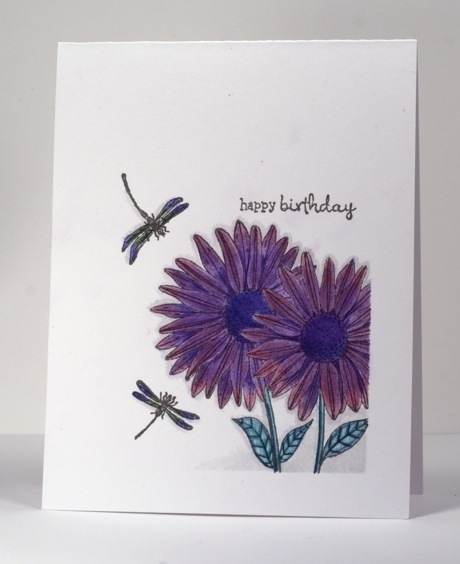 I am short on birthday cards so I stamped these daisies in Smokey Gray versafine ink and coloured them with Faber-Castell polychromos pencils. I masked with post-its first to create two margins then used coloured the images and added a pale grey shadow around them and at the edge of the masks. Go and check out all the entries for inspiration plus.